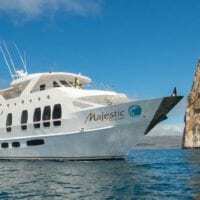 On this journey, you will discover the glorious white beach of Las Bachas, Santiago Island (Buccaneer Cove and Puerto Egas), Rabida, Bartolome Island, and the sunken crater of Genovesa Island, Galapagos’ best natural aviary. 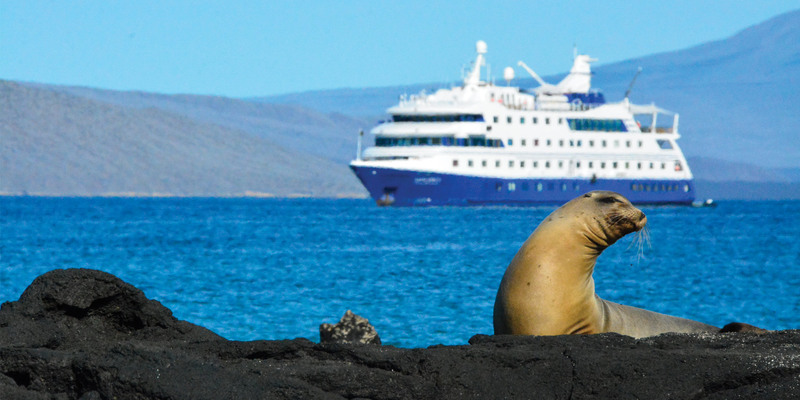 Conceived for operations in remote areas, our state-of-the-art expedition vessel affords the perfect infrastructure for Galapagos exploration. 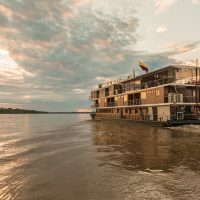 At just over 70 metres long, the generous, 5-deck craft holds 50 cabins for 90 guests and features ample, generous social areas indoors and out. 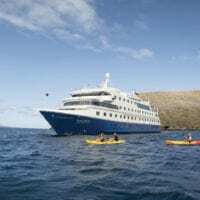 This infrastructure and the crew’s heritage of decades of experience working in the islands allow guests to make the most of their Galapagos cruise experience. 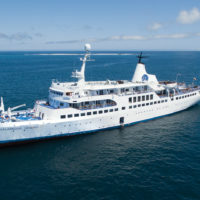 The vessels’ main features include a glass bottom boat, free use of snorkelling equipment and kayaks, wet suit rental and the use of pangas for shore excursions. Walk the coastal cliffs of Buccaneer Cove. See marine iguanas along the shores of Puerto Egas. Enjoy the submarine landscapes of Rabida Island as you snorkel from the beach. Land at Darwin Bay and see hundreds of frigates, boobies and finches. 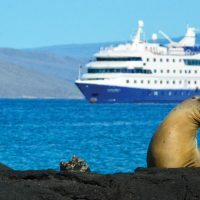 Get to see the Nazca, Blue & Red Footed Boobies, American Flamingo, Frigatebirds, Galapagos Hawks, Marine Iguanas, Galapagos Sea Lion, Galapagos Giant Tortoises, Galapagos Fur Seal & Galapagos Penguins among other species. Visit Santa Cruz, Santiago, Rabida, Bartolome and Genovesa Islands. You will land at Baltra Island by plane in the morning and be transferred to the dock to board the Santa Cruz II, where you will receive a welcome introductory briefing, boat drill and lunch. Once we disembark at the beach, you can enjoy a swim or snorkel amid a rocky shoreline, usually in the company of marine turtles. From here, we head off to our walk, a great opportunity to see land and marine birds amid landscape of tuff-stone layers and lava flows. At low tide, marine iguanas graze upon the algae beds and you can also observe a colony of fur-sea lions. After the visit, you will have some time for swimming and snorkelling. Some groups will go for a fascinating panga ride along the shores while others will disembark on Rabida Island’s red-coloured beach, caused by the unusually high content of iron in the volcanic material. This walk brings you close to a colony of sea lions, marine iguanas, mockingbirds, yellow warblers and several species of Darwin’s finches. Very close to the beach, a salt pond occasionally hosts American flamingos. This is a great place to snorkel from the beach, both for beginners as well as for experienced snorkelers, due to the unique combination of underwater species and submarine landscapes. During navigation to our next island, you can sometimes spot dolphins! The morning starts with a steep climb (only 90 feet) up some stairs to reach a flat rocky plateau. Along our walk, you can observe large colonies of Nazca boobies, red-footed boobies, great frigate birds and storm petrels. Those not wishing to disembark can enjoy a longer panga ride along the cliffs (depending on weather conditions). Kayaking is optional. In the afternoon, we land at this beautiful beach to enjoy some swimming and/or snorkelling. Following the dip, you will take an easy stroll to observe hundreds of birds, mainly frigate birds, red-footed and Nazca boobies, gulls, herons, finches and mockingbirds. Opportunity for snorkelling, kayaking and swimming. Day 5 San Cristobal Isl. You will start the last morning at the north shore of Santa Cruz Island. After breakfast, your luggage will be taken to the airport, while you visit the Tortoise Reserve. A dry landing at a passenger’s wharf and a bus ride to the loftier region of the island will provide the last highlight of the cruise: giant tortoises in the wild. The windward slopes of the island are home to two species of giant tortoises. These lush highlands include dense forests of Galapagos daisies, orchids and bromeliads, and several endemic land birds. After this visit we will transfer directly to Baltra airport for your onward flight.